Lefa is a freelance writer, editor and producer from Melbourne. You can find her on twitter at @LefaSN. Currently her day job is at the Centre for Youth Literature at State Library Victoria. In 2015 she founded Women in Literary Arts Australia, an initiative which aims to foster community and promote women in the literary arts. 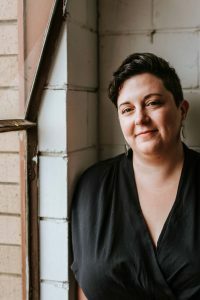 Previously she has been the conference coordinator for the Independent Publishing Conference run by the Small Press Network, programmed the 2016 comedy gala for the Campaign for Australian Aid and been the Creative Producer at Express Media. Having begun her career in publishing as an editor of student magazine Rabelais, Lefa has also been an editor of titles including Green, Green Agenda and Limited News. She founded The Pun, a print magazine produced weekly during the Melbourne International Comedy Festival from 2006-2012, which featured news, interviews and reviews of shows. Lefa has been a contributing author to two books, The Emerging Writer and The Noobz, and has been published in SBS, Overland, The Big Issue and The Age amongst many others. She has been heard on radio stations including Radio National, Triple RRR, SYN FM and 3CR. Having appeared on stages including Melbourne Writers Festival, The Wheeler Centre, Emerging Writers’ Festival, Reading Matters, and the National Young Writers Festival, she speaks on topics including young and emerging writers, editing, freelance writing, women in writing and publishing, gender, feminism and parenting. As an award-winning producer, her shows have appeared in festivals including Melbourne International Comedy Festival, Melbourne Fringe Festival and Adelaide Fringe Festival. Cartoobs and Other Typos, the show she produced for cartoonist First Dog on the Moon, received the Adelaide Fringe Tour Ready Award at the Melbourne Fringe Festival in 2012. She was the creative producer at Express Media for three years.